'SAS' button to switch 'LAS'..
Switch 'LAS' with click (Cycling). Current Action Set number visible. Auto Switch 'LAS' with a 'ER' (Emergency) option. Auto Switch 'LAS' for PVP or PVE. Auto Switch 'LAS' with a specific 'STANCE'. With 'Link' option, 'STANCE and 'LAS' can be link in both way. 'SAS' Button can be move anywhere..
'SAS' Auto Switch 'Stance' preview..
How to use a specific 'LAS' for PVP or PVE ? Just select the desired 'LAS' and set option with check PVP or PVE. If you are in 'LAS' 1 and if you want use 'LAS' 2 for PVP, it will automatically switch on 'LAS' 2 when you enter into a Battleground . Same for PVE, if you set 'LAS' 1 for PVE, after the Battleground it will automatically switch in 'LAS' 1. But if you have not 'LAS' associated with Auto switch does this happen nothing. How to use a specific 'LAS' with a 'STANCE' ? How to switch 'LAS' ? Just click to 'SAS' button, this a cycling switch..or use slash command. How to switch 'LAS' with Macro? Make a macro with /sas command, and use it. Without parameter this a cycling switch, with 'LAS' number you switch directly in desired 'LAS'..
'SAS' have a restriction ? Yes, you can only have one PVE and PVP Auto Switch set at same time for all 'LAS' available, or nothing set if you want..
How to use 'ER' ? 'ER' (Emergency Switch) is an original idea of Clotho, provide change of 'LAS' (spe heal) in case it is low in Health and therefore use heal abilities of the 'LAS'. 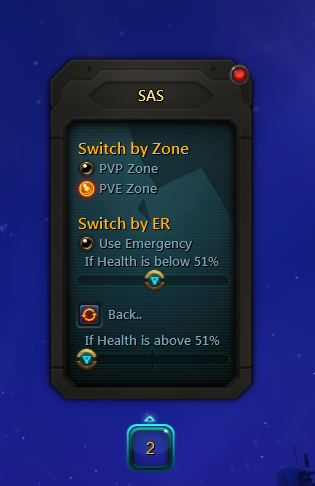 How it works ?, with 'SAS' you select the 'LAS' (spe heal), then the options you have an area named 'Switch by ER' check 'use Emergency' button and choose what health percentage you want that 'LAS' (spe Heal) be used. Of course we cant change 'LAS' in combat, the maneuver is to come out of combat (Healer run very fast!). What 'SAS' is watch your health and if they are less than the percentage specified in 'ER' and you just get Out of Combat, switch to your spe heal. Example: You are in DPS 'LAS' and you have a HEAL 'LAS' set with 'ER', you fight !! you fight ! !, and you are low in health, your run !! run ! !, hop 'Out of Combat' come and 'ER' auto switch in your HEAL 'LAS', go full life with abilities and auto switch to previous DPS 'LAS'..
Minor issue with 'unit' is nil resolved..
'SAS' button can be move anywhere now (click at left button border and drag)..
With 'ER', slider to use 'Back' option have now always at minimum the % come from 'Emergency' slider..
Another Bug for 'SAS' counter not updated,resolved. Bug for 'SAS' counter not updated after (Warrior) 'Stance' switch, resolved. Add code for 'ER' Switch, if your class are 'Esper / Spellslinger / Medic' you see this new option..
PVE/PVP Auto Switch revised, work much better now. Now if your class are Esper / Spellslinger / Medic you see new option 'ER' instead of 'Stance' (Work in progress). Added tooltip with 'SAS' version in switch button. Added Slash command /sas to switch by Macro. Add 'Stances" option to use a specific 'Stance' with a selected LAS. Removed Addon information from System chat. Bug with 'LAS' sometimes not switch after enter in PVP Battleground, resolved. Click area to switch LAS adjusted. BUG with Bad index of LAS after log in resolved..